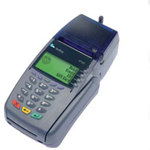 The VeriFone Vx510LE offers the latest, security and reliability advances for your business. ItÃ¢â‚¬â„¢s optional GPRS broadband connectivity, efficient processing, realiable security processing and high-speed thermal printer are just a few highlights. Download PDF of the VX510LE Terminal. The Vx 570 countertop solution takes performance to the next power by combining superior speed and power for quick and reliable payment processing with increased memory to support multiple value-added applications. Download PDF of the VX570 Terminal. 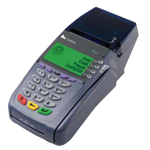 VeriFone’s RoHS-compliant Vx 610 is the latest in wireless credit card terminals. This terminal provides a wireless solution that delivers blazing performance, high-end functionality, and exceptional ease of use, without tying customers to a fixed location. Download PDF of the VX610 Terminal. 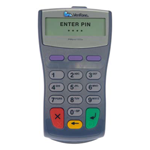 VeriFone’s best-selling, PINpad 1000SE features a revamped ergonomic design and ofers even more versatile solutions for a variety of payment environments. 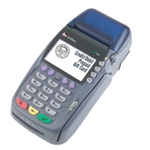 This is the perfect solution for merchants looking to benefit from the rapid growth in debit card transactions. Download PDF of the PinPad 1000SE.